European gas hub price volatility has been in steady decline over the last 3 years. But despite this trend, there have been several periods of aggressive price spikes. These periods have been important drivers of the value of flexible gas assets such as swing and storage. As winter matures and gas storage levels decline, we are again moving into a higher risk period for price spikes. European gas hub price volatility has been in steady decline over the last 3 years. We explored the factors behind subdued volatility in an article last year on the death of gas volatility in Europe. But despite this trend, there have been several periods of aggressive price spikes. As winter matures and gas storage levels decline, we are again moving into a higher risk period for price spikes. Falling levels of price volatility have contributed to a sharp drop in the market value of flexible gas assets (e.g. swing & storage). But the periodic price spikes have been important drivers of the value of fast response flexibility (e.g. fast cycle storage). In this article we look at how to treat price spikes when valuing gas flexibility. 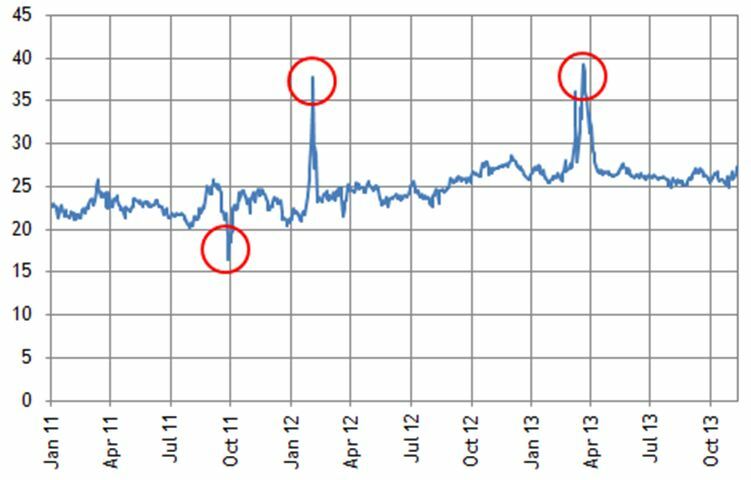 The main cause of price spikes is unforeseen shocks to short term fundamentals, often involving some form of major supply side incident. The impact of supply shocks close to delivery are magnified by the inherent inflexibility (or inelasticity) of short term gas supply. Three recent examples of European gas price spikes are shown in Chart 1. Oct-11: An unseasonal autumn heat wave caused a fall in gas demand with surplus gas trapped in a temporarily oversupplied market. Feb-12: An unexpected cold snap across Europe caused a temporary shortage of short term deliverability into North West European hubs. Mar/Apr-13: Prolonged periods of cold weather, low storage levels and major Norwegian supply disruptions caused a more prolonged period of tightness in the UK gas market, with price volatility exported to the Continental European hubs. Each of these price spikes exhibits different characteristics (e.g. direction, magnitude, duration). But in order to better understand the impact of spikes on flexibility value, it is useful to explore the analysis of gas price behaviour in some more detail. The value of flexible gas assets (e.g. swing contracts and storage capacity) is driven by differences in the value of gas across time periods (inter-temporal optionality). Valuing these assets is a complex problem because the decision to utilise flexibility in any given period impacts the availability of flexibility in other periods (path dependency). But ultimately flexibility value is driven by the behaviour of price changes (or price returns) between periods rather than the absolute price level in any particular period. As a result, the pricing models behind gas flexibility valuation methodologies are concerned with capturing the period on period change in prices (price returns). This includes consideration of price spikes which consist of more extreme examples of price changes. In most basic spot price models, the natural log of price returns (loge(pt/pt-1)) is assumed to follow a normal distribution with the width of the distribution governed by the level of volatility. However, a common criticism of these models is that the distribution of observed gas price returns exhibits ‘fat tails’ when compared against a normal distribution. Price spikes are typically the culprit. A theoretical modelled distribution of price returns, based on measured historical volatility over the actual dataset, including price spikes (red dashed line). A theoretical modelled distribution of price returns, based on measured historical volatility over the actual dataset, filtering out price spikes (green line). The definition of a price spike is somewhat subjective. But in the filtered calculation we have filtered out every price return that is greater than 3 standard deviations from the mean. The actual price returns reassuringly follow the classic bell shaped curve. However the theoretical distribution based on an unfiltered volatility calculation (red dash line) implies a much wider distribution than what was actually observed (blue bars). In many cases, a valuation based on the unfiltered data will over value flexibility. 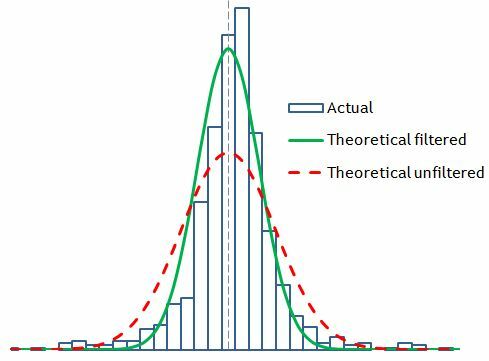 The theoretical distribution based on the filtered data (green line), gives a distribution that is a much closer width than the actual distribution. But this distribution underestimates the possibility of extreme price movements, which are an important driver of flexibility value (especially fast response flexibility). So given current market conditions where price spikes are a major source of value, it is important that they are in some way accounted for in flexibility value analysis. In many cases option 1 is chosen by default without explicit consideration, by using an unfiltered price series to calibrate a pricing model. But this can be a bit like trying to hammer a square peg into a round hole. It creates price paths with a dog tooth pattern (many sharp price movements around the mean), generating theoretical price return distributions similar to the red-dashed line in the chart. This will generally result in flexibility being over valued (especially fast response). Option 2 would at face value seem to be the most sophisticated. Incorporating spikes via a factor in the pricing model can generate price paths that look very similar to actual spot price history. However, estimating the parameters for these models is not straightforward or intuitive. In addition, it precludes the use of some flexibility valuation techniques (e.g. trinomial trees) as it becomes difficult to analytically generate conditional probabilities for more complex price models. Option 3 appears to be the crudest approach. But isolating spikes and separately estimating the incremental value they create is typically the most simple and transparent means of tackling the problem. Isolating the value contribution of spikes also allows a more robust analysis using several different benchmarks. A useful starting benchmark is the flexibility value that could have been realised from different historical periods of price spikes. As is often the case, simplicity and transparency is likely to increase confidence in using analysis to inform commercial decisions. Is the UK gas market facing a supply crisis?